Where do you turn in your darkest times? Putnam County Cares and provides Suicide Prevention, Education & Awareness. We give you the resources you need to get help before you or someone close to you loses hope. Police, Fire & EMS contact information and helpful safety tips. Keep your Emergency Go Kit stocked. Know what to do after a car accident. Putnam County Cares and we want you to be prepared in an emergency. Enjoying life means staying healthy. Use this section to keep your mind and your body in shape. Eating healthy and exercising will set you on the path for success. How do you get from point A to point B in Putnam County? Putnam Moves keeps you informed. Need the bus? Get the latest bus route schedules. Does your street need repair? Access the County Executive’s Operation Smooth Streets form to report your street defect. NOW AVAILABLE ON GOOGLE PLAY & APPLE APP STORE! 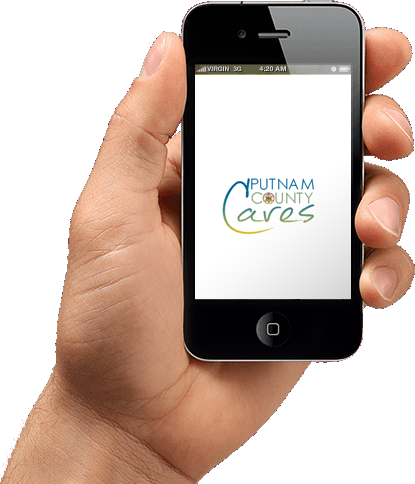 On your android /ios device, Click Google Play Store/ App Store and type in “Putnam County Cares” and Click to Install! From Antiquing to fine dining, find what you need in Putnam. Whether your interests lay in nature, sports or history, Putnam has something for you. Live here or visit here, we have a lot to offer. From quaint country stores to nationally recognized brands, Putnam makes shopping easy. Putnam is the place to be. Do you have time to spend? Spend it in Putnam. There’s always something going on, for the young, to the young at heart, we’ll let you know where the fun is.